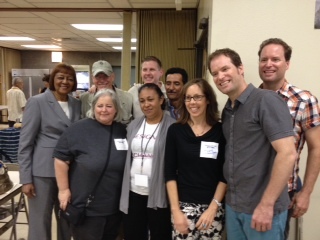 I attended the Saturday portion of the Mission conference at Union Church. Elders and Pastors from the churches of Pacific Presbytery gathered with our local and international mission partners to celebrate the good work that is already happening and imagine together possibilities for future partnership. Together we sang, studied God’s word together, celebrated communion, and we learned about the experiences of our partners in Nicaragua, the Congo, and Southern California. For me, it was powerful to connect with the stories of God’s work unfolding in our neighborhood and around the world.- holding in one hand the crushing struggle to survive hardship and violence and holding in the other hand the hope and love that God invites us to share through our lives. This entry was posted on Monday, October 7th, 2013 at 1:10 pm and is filed under Member news, Mission, Reflections, Snapshots, Special Events, Staff Happenings. You can follow any responses to this entry through the RSS 2.0 feed. You can leave a response, or trackback from your own site. Thank you for sharing your experience at the conference.